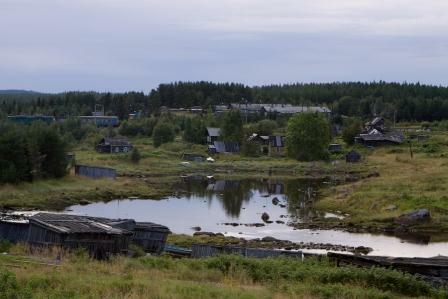 Poyakonda (Kandalaksha district) is known for two reasons: it is the birthplace of Venedict Yerofeyev, and it is near the White Sea Biological Station of the Moscow State University. The village is first mentioned in 1563 documents. The name originates from Saami “payakonda” and means “edge” (of the bay). Contrary to common opinion, the White Sea (which can be considered a bay of the Barents Sea)is not cold and dead. I’d like to present my colleague and namesake Alexander, whose job and passion is to photograph White Sea creatures. He spends a lot of time in the Moscow Sate U. research station near Poyakonda, right on the arctic circle. More pictures of Alexander Semenov on his website Clione.ru (English)and in his blog (Russian). Unfortunately, perhaps one of the country’s and the world’s greatest underwater photography experts profoundly lacks interest in organizing diving tours in exchange for contemptible $$. If you happen to be real hot about immersing yourself into this see with a camera, tell me, and I’ll put you in touch with people in or around Kandalaksha. Write to alexandragor4@yandex.ru or leave a comment below. Or, better, do both because at least 5% of e-mails seems to get lost in transit.